KIDDING aside, have a great day! I shouldn’t, but I can’t help myself. I just have to weigh in on this. It’s just too much like fun not to. Hitler thought he was a terrific military strategist, and would ignore the advice of his own generals. To the point where some of them—von Stauffenberg and others, for example—realised that Hitler was going to cost them victory, and that getting rid of him was in Germany’s best interests. You’ve seen Valkyrie, right? Churchill himself vetoed any plans to have Hitler assassinated, because Hitler’s replacement would probably have done a better job of prosecuting the war against the allies. 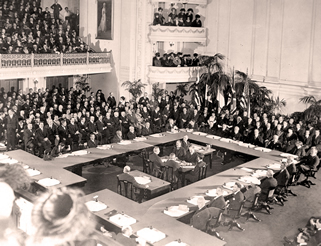 The Treaty of Versailles forced Germany to pay a huge amount in reparations for the first world war. Germany—the German people—suffered because of it, so it should be no surprise that the resulting conditions prepared the ground for someone to step in with a promise to make things better, because it was what everyone wanted to hear. I’m not the only one who thinks that the treaty made WWII pretty much inevitable. So, let’s say someone went back in time and took Hitler out before he rose to power. Would it have avoided WWII? I don’t think so. I think it would still have happened, and there’s a good chance that it would have happened under a leader who let his generals do their jobs. There’s a damned good chance we’d have lost. In other words, I think the only reason anyone would want to erase Hitler from the timeline would be to improve the chances of Germany winning WWII. Now, a few people have suggested that people with time machines might have tried, and failed, to whack Hitler before his rise to power. I present here another possibility: that someone else led Germany into a war that they won, and then time-travellers went back and whacked that person specifically so that Hitler would lead, badly, and the Nazis would therefore lose. Just like they did. On the left, we have a list of important things around us in daily life—for example, Day Job, Food, Coffee, and (of course) Writing. And they’re arranged here in the order many writers would agree with. The most important things are at the top, so Writing is just below the Day Job (marginally more important because it pays for the stuff you need to write—computer and software, or a typewriter, or pens and paper, or parchment and quills; they all cost cash), and dealing with a burning house is more important than that—if only because a burned-out house means you have to write in your local Starbucks, which might not be too comfortable (their appalling choice of ambient music being a real concentration killer, and all that). As we writers know, Normal People think we have the same priorities they do (strange, but apparently true). And this is where we get a problem. The bigger the difference between a Writer’s priority for something, and a Normal Person’s priority for that same thing, the more Friction there is. 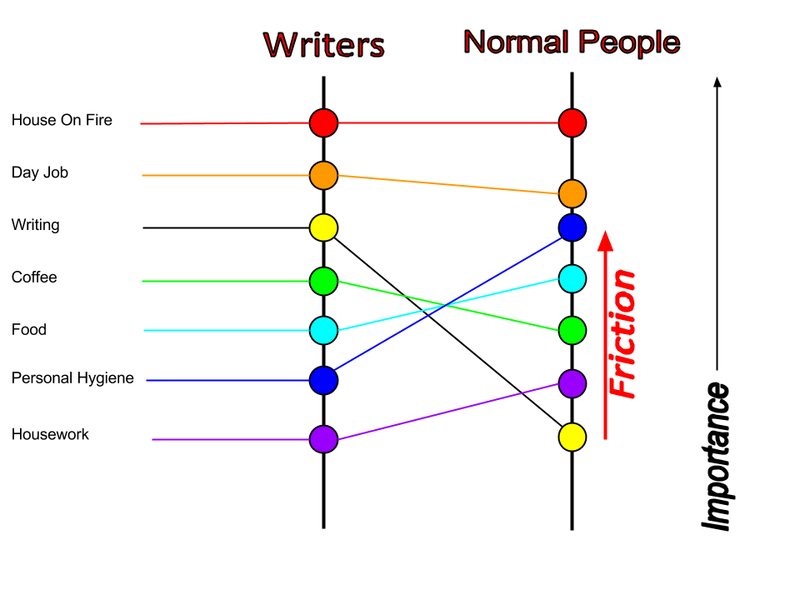 And as you can see from the diagram, there is a big difference in the priorities for Writing. We writers put it up high, where it belongs. Normal People put it lower than scrubbing out a trash can. And this is why Normal People just don’t get us. You’re writing, and other people can see you’re writing. You’re doing real work, and it takes focus, and getting into and staying in The Zone means no distractions. But a Normal Person looks at you and sees someone messing about, not doing anything vital. And there are trash cans that need scrubbing. Cue the Friction.